I didn't expect too many people to show up to see Alcatrazz, coz this band was active in the early 80's and with so many bands on tour they kinda drowned in the masses... No opening act was announced, so I didn't know what to expect when I arrived at Zeche Carl. And there were only a handful people, but luckily some more arrived while the support was on stage. 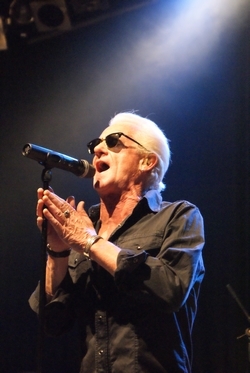 After a break it was time for Graham Bonnet and his Alcatrazz! They kicked off with Eyes Of The World and within moments they made the people move. At the beginning the vocals weren't loud enough, but soon the sound engineer had balanced the sound. Very cool Howie Simon's guitar part where he played with a bottle neck. 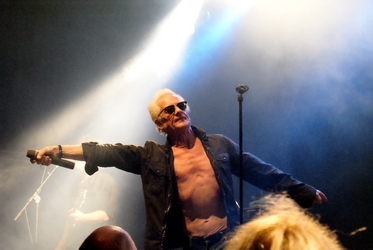 Next in line was a song from No Parole From Rock'n'Roll - Too Young To Die -, but first Graham Bonnet said a few words... "We have some technical problems, so welcome to our 2nd rehearsal!" And he told us that he's sober for 7 ½ years now... "So buy me a drink!" he was joking. Too Young To Die ended with short guitar solo and they headed into God Blessed Video. The Big Foot / Jet To Jet medley made the fans sing along - and that made Bonnet smile. 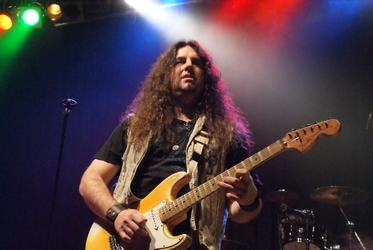 Between the songs Mr. Bonnet talked to the audience and mentioned their friendship with Ronnie James Dio and that they all wish him just the best. "Hope we will see him on tour soon!" The people responded loudly. And it got even louder when they played the first notes of Kree Nakoori / Hiroshima. Graham Bonnet and bassist Tim Luce were talking and joking. 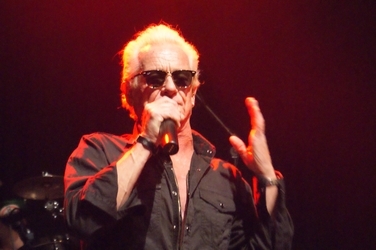 "I think we have some Michael Schenker fans here... We had some arguing, but I don't want to talk about it no more" Graham Bonnet explained before they kicked off Desert Song off 1982's Assault Attack. Mr. Bonnet missed one or the other note, but who cares?! "Sorry, I lost my in-ear, but after 3,000 years of rock my ears are..." the rest of Graham Bonnet's words got lost in the laughter around me. Even if the voice of Alcatrazz sat down at the drum riser once in awhile, most time he was in action walking around the stage. Towards the end it was time for some Rainbow stuff! All Night Long and Since You Been Gone were very welcome and it seemed that everybody was singing along... Okay, the screams aren't as high as in the 80's, but come on, we all get older! And too soon it was over, even if Alcatrazz played a lot of No Parole From Rock'n'Roll and a few songs from Disturbing The Peace plus some stuff off Rainbow's Down To Earth. The fans wanted more and so the foursome came back... "Let's do a quick one!" And it was obvious that it wasn't planned, coz Graham Bonnet already took off his in-ear monitoring device and they played Night Games from his 1981 solo album. I think nobody regretted to spent the night at this concert, even if some left straight after the show. Others who were spending a bit time at the merchandise had the pleasure to meet Graham Bonnet and his mates for a little chit-chat, some photos and autographs. Resume: It's a pity that not more people came to see Alcatrazz, they rocked the house! But also Bad Dog Bites left a good impression, obviously coz they sold some copies of their CD Riding On. Thanks again to Impulse Promotion and Rockville for their support!